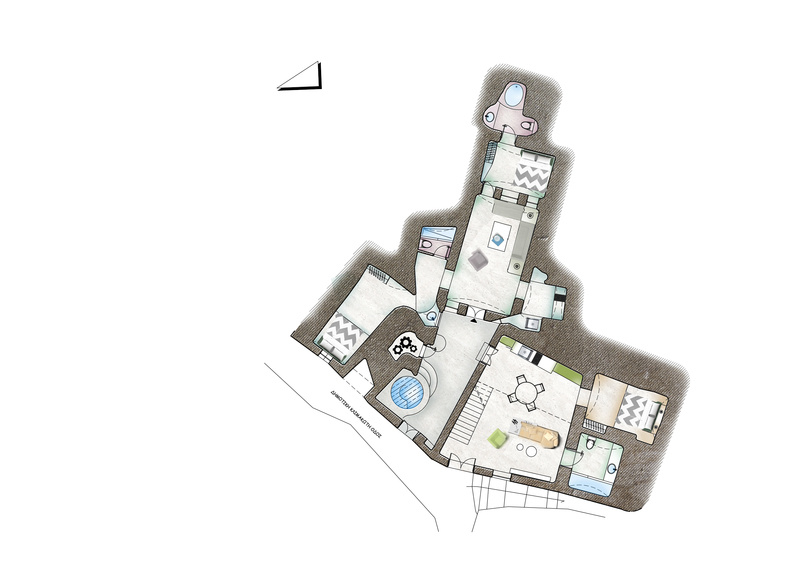 These two beautiful villas are proudly located in Pyrgos, a traditional village famous for its Venetian castle, panoramic views and narrow alleys. The original architecture of the village is an interesting combination of stately houses and domed shape cave houses. 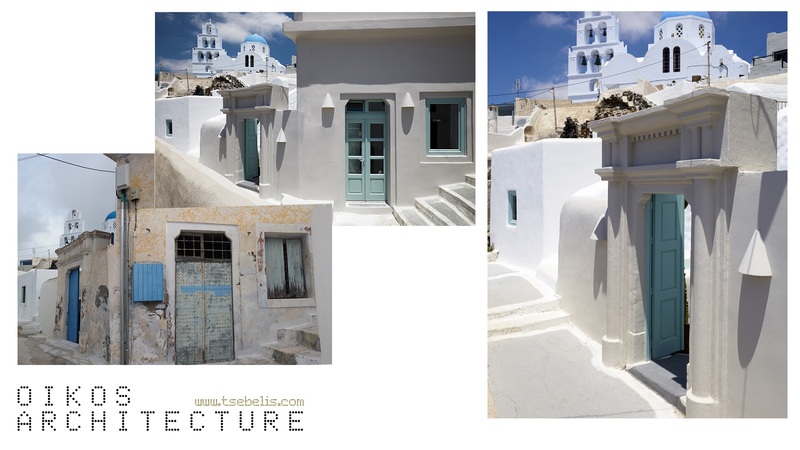 The beautiful villa, originally an old grocery store, combines traditional architectural elements with contemporary interior design, fully harmonized with the natural environment in the picturesque village of Pyrgos. The main concept was to maintain the authentic island architecture mixing it together with modern design, comfort, elegance and luxury. Trace from the past building can be found in the use of the green color against the white scenery. The cave house was fully reconstructed, as only the ruins of the old house was at first found. The bright and airy interiors of this renovated traditional house are full of Cycladic charm: gentle white tones, the smooth plaster walls and the traditional elements such as built-in beds, tables and sofas frame the ever-captivating views. 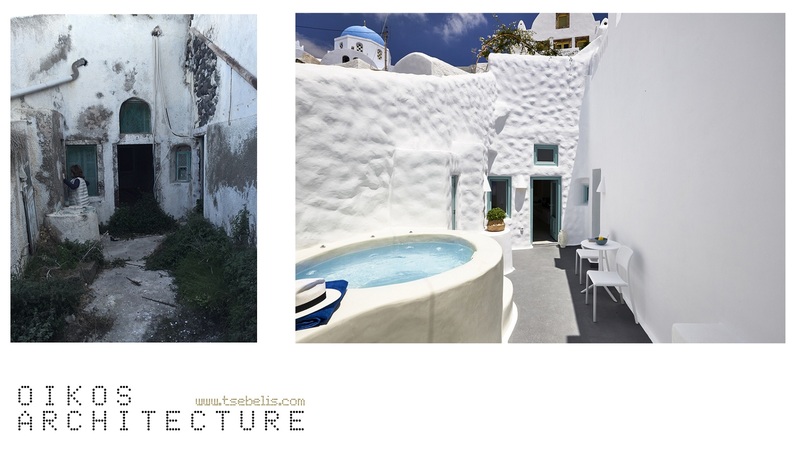 An outdoor heated Jacuzzi and a quiet patio, where guests can relax and enjoy undisturbed the feeling of Santorini, give these two traditional villas a great advantage. Suites are crafted with respect of the tradition and combine the warmth of Greek islands charm with the convenience of modern amenities. The skillful use of natural materials, inviting color palettes, furniture of exceptional elegance, antiques of historical and sentimental value and a touch of multicultural design, create a relaxing and sensational ambience indoors and outdoors, ideal for guests who are willing to feel the unique spirit, eternal beauty and energy of authentic Santorini.